Mergers and Acquisitions (M&A) Environmental Due Diligence - Environmental Performance Inc.
Mergers and acquisitions (M&A) environmental due diligence is a multi-disciplinary knowledge based process with the key objective of identifying all aspects of environmental risks that come into play during the acquisition of a company. While the threshold of risk can be substantially higher than that for a specific site related issue, these risks cover a range from major internal environmental liabilities to third party liabilities associated with Superfund sites. EPI has provided advice on over $20 billion of M&A transactions nationwide for commercial and industrial transactions since it was established in 1995. Transaction sizes have ranged from several million dollars to a billion dollars. EPI’s professionals have experience in understanding the business processes and are able to identify environmental risks, which in many instances are not obvious during a transaction. Contact us for your M&A due diligence needs before you go too far into the negotiations. What we find may make a difference in your acquisition price. 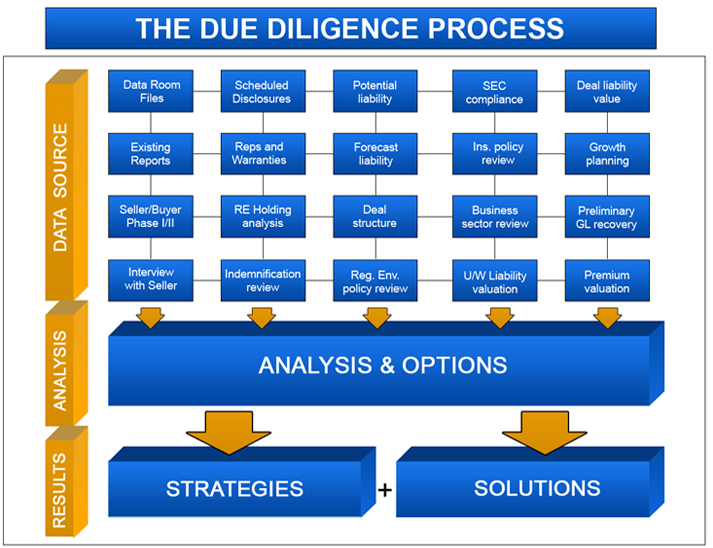 A schematic representation of the knowledge base analyzed by EPI professionals during the M&A due diligence process.